So I just finished a doorstop of a novel by an author named Stephen King who came out of nowhere and just might have a career ahead of him as a novelist. I keed, I keed. Obviously, Stephen King's new book will sell just fine, with or without my review. But for what it's worth: Pick up this book and read it. Ask for it for Christmas. Put your name on the waitlist at your friendly local library. You will devour it, and you will be entertained. This is King's writing at its finest. 11/22/63 concerns time travel. Jake Epping, an English teacher living in 2011, gets the chance to step back in time. His mission is to stop the Kennedy assassination. If Kennedy doesn't die, Johnson doesn't assume the presidency and maybe, just maybe, the U.S. stays out of Vietnam, saving thousands of American lives. And who knows how else the world will benefit? Naturally, it's not that simple. Jake has to navigate a past that's resistant to change, all while trying to set as few metaphorical butterfly wings flapping as possible, for fear he'll cause other changes to the future that could be less beneficial. Any good fan of sci fi will enjoy learning the rules and repercussions of time travel in the world King has created. With any time travel story, you get a kick out of asking yourself, Could I live without the Internet? How would I get by if someone took away my iPhone? And my TiVo? And the advances in health care and frizz-control hair products that I rely on every day? And of course, the main question is irresistible: If Jake can stop the Kennedy assassination (a pretty big "if" in the book), what happens to the future? How will it be altered? The possibilities are delicious and terrifying, and you'll race through the chapters to see how it all play out. In addition, King has written a fantastic female character in Sadie the librarian. I've found King's treatment of women troublesome in the past (the less said about Beverly in It, the better). But Sadie is sad and bold and troubled and brave, a heroine worthy of joining Jake's epic quest. Bravo to King for getting this character right. To be sure, King isn't known for his strong endings. It sometimes seems as if, in the last 50 pages, he tosses up his hands and says, "It was all aliens, OK?" Not with this book. 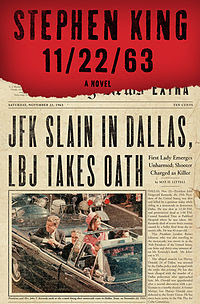 11/22/63 races to a ferociously paced conclusion. And the ending, while bittersweet, is exactly as it should be. Seriously, keep an eye on this King fella. I think he's going places. 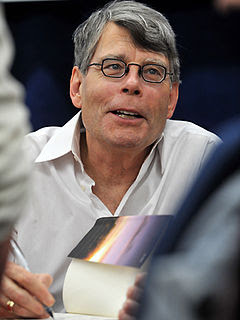 I love Stephen King! You're right about some of the endings to his books though, it's good to hear that this novel has a stronger ending. This gives me even more reason to read it.